Now, when you think of the color purple, you think of fancy royal pageants and fabulous balls. Purple has been adorning royalty and courtiers for centuries because of its rich and luxurious look, so get in on the act and adorn yourself with some wonderful purple jewels. Purple earrings are your ideal accessory. They’re sleek, delicate and give a wonderful pop of color to your face, helping to bring out those beautiful eyes! So, now’s your chance to grab a sparkling gem and decorate yourself accordingly. Here are 8 gorgeous purple earrings you have to check out, and you know you won’t be able to resist that purply charm. If you’re looking for a dainty little gem that will add some color to your world and will provide you with just the right amount of sparkle, then these beautiful purple earrings from Gem Stone King will be right up your street. These little purple earrings feature a genuine natural amethyst stone, which has been cut to a round shape and is multi-faceted, so as to allow for maximum light catching and radiance. The stones are set in sterling silver, with sterling silver butterfly backs to keep the on your ears securely. Each earring has a diameter or 6 millimeters, so they’re dainty but are still large enough to be seen on your ears. These dazzling purple earrings are ideal for wearing everyday, as they’re durable as well as being delicate enough for any occasion. They’d look great with black outfits, where you just need a little touch of color to finish off your style. The natural amethyst also means the earrings have special healing powers, as amethyst is said to help protect and calm you, and keep stress at bay. So, with these little stud earrings, you could wear them all the time without even knowing they’re there, meaning you’d be stress free all day! Amethyst is also the birthstone for the month of February, so they’d make an exciting and stylish gift for any loved one. For anyone who loves the rock and roll lifestyle or the edgy fantasy style, then these purple earrings are definitely going to take your fancy. They’re trendy, with a Gothic edge and they’re sure to add a funky touch of color to your wardrobe. 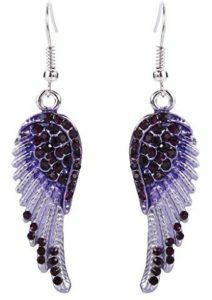 These purple earrings feature a silver tone metal carved into the shape of an angel wing that dangles from a silver tone hook. Each wing has been detailed and painted purple, with purple Austrian crystals adding extra sparkle and glitz to the design. The Austrian crystals are designed to look like amethyst gemstones, giving a magical element to the earrings. The earrings measure just under 2 and a half inches in length, from the top of the hook to the bottom of the wing, so they’ll hang noticeably on your ears. These are fantastic earrings for showing off your personality and adding a good dose of sparkle to your day. They’d add a brilliant touch of color to a black outfit and would go fabulously with other jewelry. They have a delicate look about them, which makes them ideal for wearing everyday to jazz up a casual style. These purple earrings would also make a stunning gift for anyone who’s into urban fantasy literature or movies, or just loves that Gothic style. If you’re in search of a piece of jewelry that has a little bit of glitz as well as a delicate touch of color, then these stunning purple earrings from Vesil could be just what you’re after. 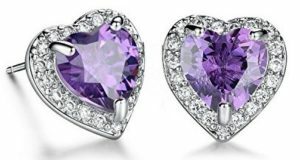 These beautiful earrings feature a heart shaped purple cubic zirconia crystal, surrounded by smaller clear cubic zirconia crystals, which are all cut to reflect light and sparkle brilliantly. The crystals are set in an 18 carat white gold plated copper, which adds radiance and gives the earrings their chic, classy look. These little stud earrings each measure just over a quarter of an inch in diameter, so they’re dainty and delicate, and will shine wonderfully on your ears. The backs of the earrings are little plastic discs, so they won’t irritate your ears. These earrings are ideal for any occasion, and their small size means they’re great for wearing everyday, either to work or out with the girls. They’ll add a beautiful touch of color to any outfit and will really add a glitzy touch to your casual styles. With these pretty earrings you’ll be able to wear your other jewelry without them being too overbearing or distracting. They would also look fabulous with some other purple detailing, such as a chic scarf, to help bring out their purple color. Now, how could anyone resist this gorgeous sparkle! These beautiful purple earrings have it all! Glitz and glamor, as well as a chic elegance. I mean, what more could you want from a piece of jewelry! 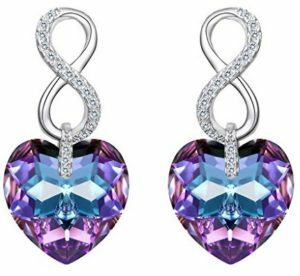 These stunning purple earrings feature a dazzling purple Swarovski crystal crafted into the shape of a love heart. This beautiful purple heart crystal sits at the bottom of a sterling silver infinity symbol that is encrusted, on one side, with clear Swarovski crystals, giving these earrings even more luminosity and radiance. The backs of the earrings are butterfly backs with friction backs, in sterling silver, so they’ll stay in place on your ears and are kind to sensitive skin. The earrings measure just over an inch in length and just over half an inch wide, so they’re large enough to be seen without being too overpowering. These earrings would make the ideal gift for any loved one, especially with the love heart and the infinity symbol design. The color in the crystals is so beautiful that these earrings will go with just about anything. They will look ultra glamorous when you wear them to a swanky event but they’ll also look super chic when you wear them with your casual styles, giving you an extra element of glitz to add to your wardrobe. If you’re in need of a bit of fun and are looking for the perfect purple earrings that will go with your laid back attitude and style, then these fabulous Hawaiian plumeria flower earrings from Chadada are just what you’ll need! These beautiful purple earrings are large and bright, and are sure to add a glamorous touch of color to your wardrobe. 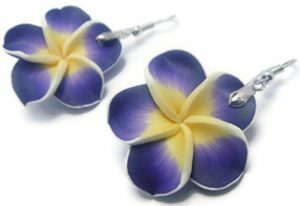 They feature a plumeria flower crafted out of Fimo clay and painted with a gorgeous shade of purple, with yellow detailing in the center to give the flower its realistic appearance. The earrings are set on a silver tone metal bail and have silver tone fishhook backs, so there are no fiddly backings to get to grips with. These purple earrings are more of a statement piece and they will certainly be noticeable when they’re dangling on your ears. 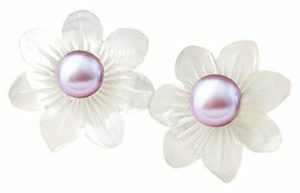 Each flower earring measures almost an inch and a quarter wide, so they will be pretty prominent when you’re wearing them. These fabulous earrings will be the ideal accessory for the summer, where you can bring your tropical style to any event you attend. They would make a fantastic piece of jewelry for a pool party or for chilling at the beach in exotic style. These would also look extra glamorous with a little white sun dress, where you just want a casual piece to add a fun pop of color to your style without the glitz. These darling little earrings are just what you need to brighten up your day and keep your personality sparkling all day long. Not only are they super cute but they’re stylish and chic, and will definitely add a touch of glitz to your everyday world. These stunning purple earrings feature little sterling silver studs that are each carved into the shape of a little butterfly. The wings of each butterfly feature genuine purple amethyst crystals that are multi-faceted to reflect as much light as possible and to give maximum sparkle. The delicate little earrings measure around a quarter of an inch in length and are just a little bit wider than they are long, so they’re great for wearing as an everyday piece of jewelry. These adorable little butterfly earrings will add a fabulous but delicate touch of color to any wardrobe and because of their size, you can wear them all the time, no matter what the occasion. The natural amethyst stone, which is said to have magical powers, will help you to stay stress free and will help to encourage positivity, so it’s a wonderful piece of jewelry for both style and function! Amethyst is also the birthstone for the month of February, so, if you can bear to part with them, they would make a gorgeous gift for friends and loved ones. If you’re looking for a piece of purple jewelry that’s a little less glitzy and a little more modern, then how about these gorgeous purple amethyst stud earrings. They have a more contemporary design that will look awesome with any trendy wardrobe. These brilliant purple earrings feature round sterling silver studs, each with a beautiful round genuine purple African amethyst stone, giving a delicate pop of color to this dainty little style. Each stud earring measures just 4 millimeters in diameter, so they’re just under a quarter of an inch wide, meaning they’re fantastic for wearing with a range of styles and pairing with other earrings and jewelry. The backs are also sterling silver, with butterfly friction backs, so they’re ideal for anyone with sensitive skin, as they’re hypoallergenic. These tiny little earrings have just enough sparkle to make them dazzle as the light catches them and they’re the perfect little piece of jewelry to wear everyday with any style you like! Their contemporary design means you can wear them to add a little touch of color to your casual wardrobe, without looking too blingy, and you know they’ll look great with your daily styles! They’re also chic enough to wear on nights out with your friends or for a day out at the mall. With amethyst being the birthstone for February, these stunning earrings would make an extra special gift and they even come packaged in a cute little gift box, so they’re ready to go! 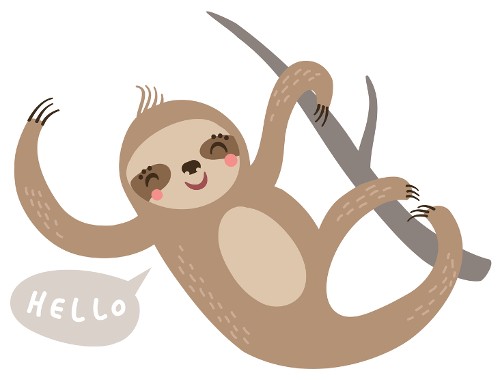 So, you’re looking for a special pair of earrings that will be dainty, feminine and delicate. Well, these little earrings have all of those qualities in abundance. Plus, they’re super chic! These stunning purple earrings feature a gorgeous mother of pearl stud, crafted into the shape of a flower and in the center of the flower sits a beautiful natural pearl in a pretty shade of purple. The pearl is a freshwater cultured pearl measuring between 3 and 3 and half millimeters in diameter and is in the shape of a button, so that it sits seamlessly on the earring. The earrings are a delicate design but, with them measuring 10 millimeters, they will be noticeable for all the right reasons. The pearls are set in sterling silver, with sterling silver butterfly backs, so they will be safe for your skin and won’t tarnish. These little earrings have an elegant look about them and they would be an ideal accessory for wearing to a wedding or a formal event. They will add a fun but sophisticated touch to your wardrobe and are versatile enough for you to wear them even with your most casual styles. They’d look fabulous with a cute little outfit when you head out to lunch with your friends! They’d also make a wonderful gift and come complete with a special cleaning cloth in their own little jewelry box – what more could you ask for!